There are less than 600 Puerto Rican Parrots left in the world. Read on to learn more about this iconic and critically endangered species. 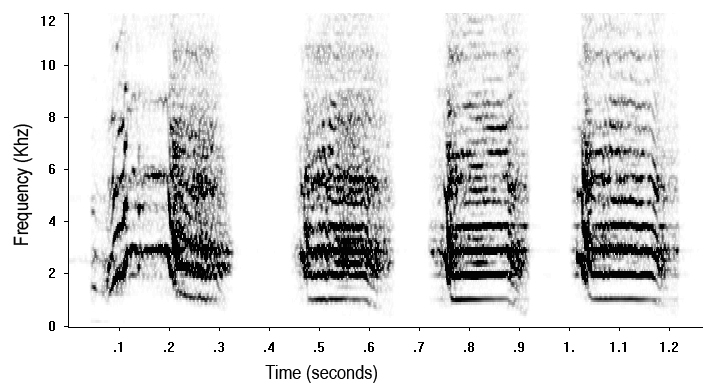 Sonogram of a Puerto Rican parrot "caw" call. Sonograms are basically "pictures" of sound. Most people know the species as the Puerto Rican parrot or the Puerto Rican amazon. Its scientific name is Amazona vittata. Before European settlers began colonizing the island in the 16th century, the indigenous taíno people who lived there named the parrot "Iguaca", after its distinctive call. Puerto Rican parrots have a body length of approximately 29 cm from head to tail and weigh about 270 grams. They have distinctive emerald green plumage on most of their body. The primary flight feathers are turquoise blue with black tips. They also have narrow band of red feathers just above the beak. The beak is a pale ivory color and the legs are tan. The eyes have dark brown pupils, yellow irises and are surrounded by a white ring of featherless skin. Males and females have almost identical plumage, although males may have brighter yellow irises and broader red bands above the beak. A map of the five Puerto Rican parrot populations (wild and captive) that existed at the begining of 2017 before the arrival of hurricane Maria. A map showing hurricane Maria's path after it made landfall on September 20, 2017. Most of the wild parrots in the El Yunque National Forest remain unaccounted for. All captive parrots in the Maricao State Forest had to be relocated to another facility. This species is endemic to (meaning it's only found) on the island of Puerto Rico. Most of the remaining Puerto Rican parrots are in one of two captive breeding facilities: the Iguaca Aviary in the El Yunque National Forest and the Jose L. Vivaldi Aviary in the Rio Abajo State Forest. The number of parrots at the aviaries can vary throughout the year, but generally, each of the facilities houses about 200 parrots. Captive Puerto Rican parrots are either incorporated into the captive breeding program or released into the wild. At the beginning of 2017, about 40 captive parrots were also being housed in the Maricao State Forest. These birds were being prepared for release into the wild as part of the third wild population reintroduction effort that began in late 2016. 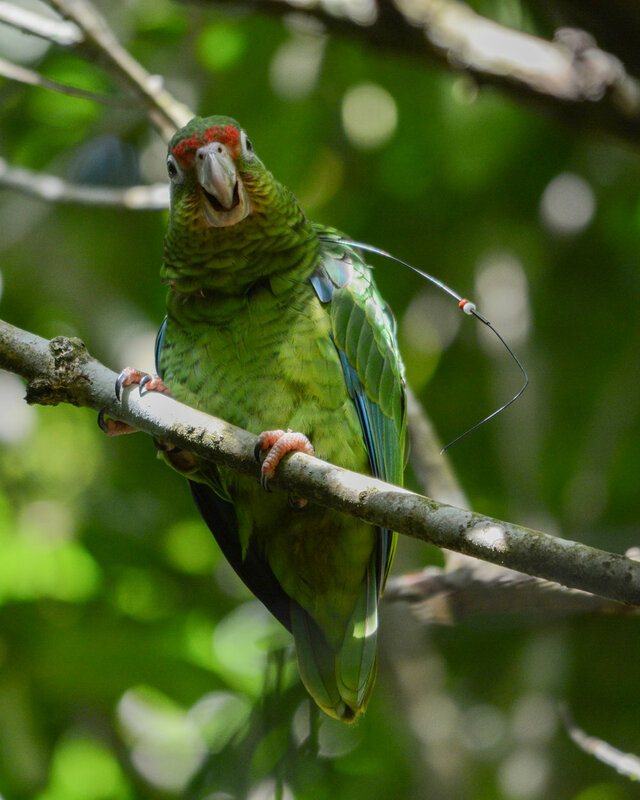 Before hurricane Maria (Sept. 20, 2017), two wild parrot populations survived in the El Yunque National Forest and the Rio Abajo State Forest. Both populations had reached record high numbers in the summer of 2017 with El Yunque's wild population reaching 53-56 parrots and Rio Abajo's wild population reaching 130-137 parrots. Sadly, hurricane Maria left a trail of devastation that took its toll on several of the Puerto Rican parrot populations. 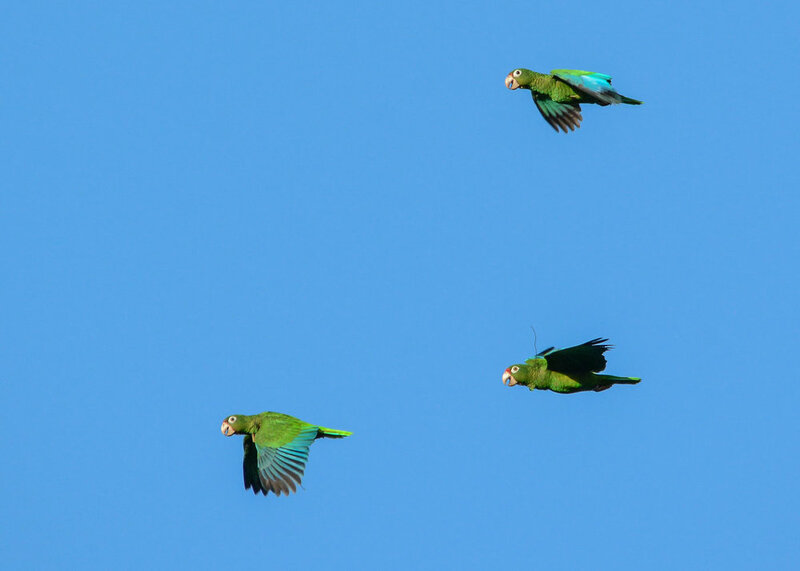 Hardest hit was the El Yunque National Forest, where biologists documented the deaths of at least 17 wild parrots and have been unable to account for most of the members of the wild flock. The wild population in Rio Abajo State Forest fared better but did not completely escape Maria's wrath. 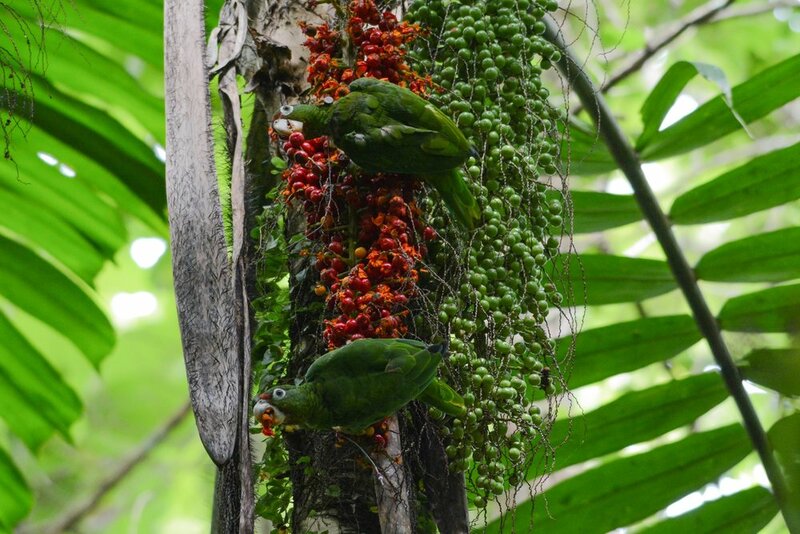 So far, biologists from Rio Abajo have only been able to account for about 100 of the wild parrots. To make matters worse, Maria caused severe structural damage to the captive facility in the Maricao State Forest, halting the reintroduction efforts at this site. The damage to the facility was so great that all the captive birds from Maricao needed to be relocated to the captive facility in El Yunque. A pair of iguacas eating coyor palm fruit(Aiphanes acanthophylla). The fruit turns bright red when ripe. Maria fruit (Calophyllum brasiliense) is another iguaca favorite. When fruits are large, the parrots like to hold them in one foot while they nibble on them. Puerto Rican parrots are herbivores. Their diet consists mostly of fruits but they also eat the leaves, buds, seeds, and flowers of different plants. They've been known to eat many different plant species but some of their favorites include royal palm (Roystonea borinquena), sierra palm (Prestoea montana), coyor palm (Aiphanes acanthophylla), guaraguao (Guarea trichilioides), and maria (Calophyllum brasiliense). A breeding pair returning to their nest to feed one of their hungry nestlings. A pair of newly hatched nestlings and two unhatched eggs inside an artificial nesting cavity. Puerto Rican parrots are secondary cavity nesters. They don't build nests by gathering materials and they don't make holes in trees. They look for existing cavities in hollow trees to lay their eggs. These cavities are not year-round homes for the parrots, instead they are only used to lay eggs and rear young during the breeding season, which usually lasts from February to July. Puerto Rican parrots are monogamous, meaning they mate for life and will nest with the same bird year after year (although some exceptions apply). Female parrots typically lay between 2-4 eggs per clutch and will normally only produce one clutch in a breeding season. Only the female incubates the eggs, but the male plays an active role in caring for the female and the young. While the female is incubating the eggs, the male will forage for food and return to the nest to feed her multiple times a day. 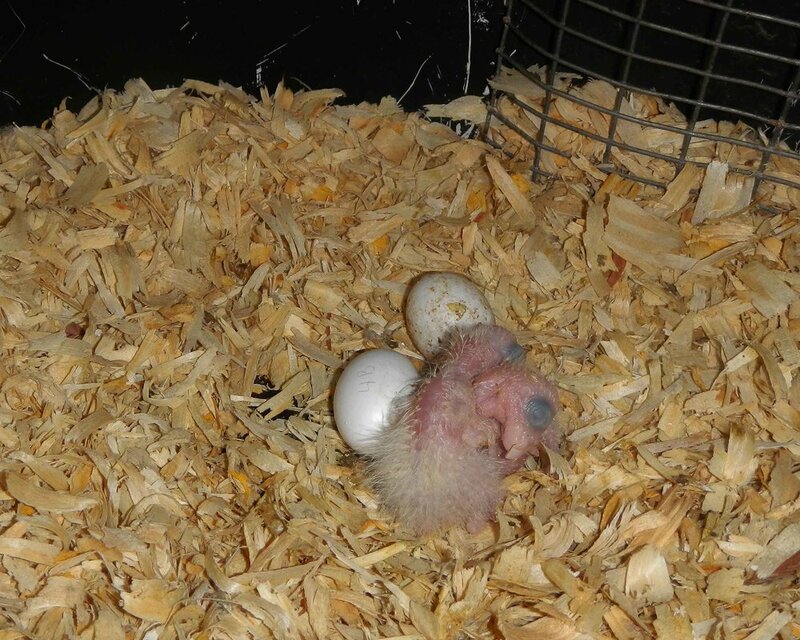 The eggs typically hatch after 26-28 days and both parents help feed the nestlings. Once the babies are 50-60 days old they will be ready to leave to the nest but they will still stay close to the parents and continue to depend on them for food for about two months after fledging.